Recently, many national news outlets picked up a story about the earthquake and tsunami threat posed by Alaska’s Shumagin Gap. The headlines were frightening. Representative examples include “Alaska at risk of a massive earthquake and tsunami similar to devastating 2011 Japan event” (Newsweek) and “Fault linked to big tsunamis found off Alaska” (The Weather Channel). The articles were based on research published in Nature Geoscience, a prestigious scientific journal, by Columbia University scientists and colleagues. While this paper contains important discoveries, they may not be the ones you’d expect from the headlines. What is the Shumagin Gap? Between 1938 and 1965, a series of large megathrust earthquakes ruptured almost the entire Aleutian subduction zone, from Prince William Sound all the way past Attu Island in the far western Aleutians. One notable patch of the subduction zone, however, did not rupture—the area roughly between Sand Point and Perryville (see Figure 1). This section became known as the “Shumagin Gap,” and researchers have spent much effort to understand why that section did not rupture and whether it might be at risk of generating a tsunamigenic earthquake in the near future. Largely based on high-resolution GPS measurements, these researchers discovered that the subducting plate was poorly coupled to the overriding crust - meaning that the huge amount of energy necessary for a large earthquake simply wasn’t building up in the Shumagin Gap. Think of it like a car engine that is properly oiled—the moving parts slide past each other easily, without anything catastrophic happening. This new research indicates that the Shumagin Gap, contrary to recent speculation that it might be a relatively “safe” seismic zone in the arc, may pose a threat similar to that of the rest of the Aleutian subduction zone. Using advanced, ship-based 3-D seismic imaging, the researchers discovered large, localized faults (called “splay faults”) above the megathrust (see Figure 2). While the majority of the megathrust may not be seismically locked in the gap, these splay faults could accumulate the stresses necessary for a large, tsunamigenic earthquake. Similar splay faults moved during the 2010 M9.0 Tohoku earthquake and contributed to the earthquake being much larger than previously thought possible in that area of Japan. Everyone involved in modeling, monitoring, and responding to earthquake and tsunami hazards in Alaska has long known that the Aleutian megathrust is capable of generating large and destructive events. Tsunamis followed megathrust earthquakes in 1938, 1946, 1957, 1965, 1986, and of course the Good Friday Earthquake in 1964. The fact that a fault system similar to Tohoku’s exists in the Shumagin Gap is a critical advancement for seismic hazard analysis in Alaska. In terms of preparedness, though, it is not the game-changer that some of the news coverage suggests. The tsunami modeling group at the Earthquake Center, in partnership with NOAA and the Alaska Division of Geological and Geophysical Surveys, included the effects of a hypothetical Shumagin Gap earthquake when they mapped potential tsunami inundation zones at Cold Bay, King Cove, and Sand Point—the Alaskan communities likely to be affected by such an earthquake. 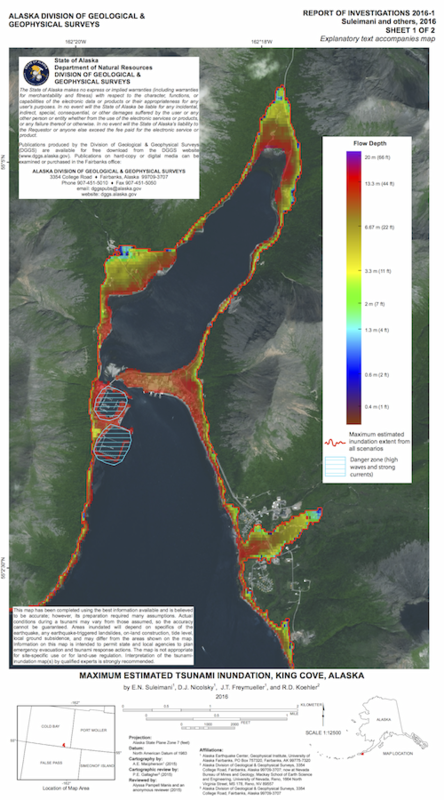 The full reports, along with those for many other communities, are available at http://dggs.alaska.gov/pubs/tsunami. If you live in or visit any of these coastal communities, we urge you to look over your community’s report. Much of the text is technical, but towards the end you can find highly informative tsunami inundation maps that show what areas are at risk of flooding based on a worst-case scenario earthquake. A web-based interface to these maps is also available on our website at https://earthquake.alaska.edu/tsunamis/atom. Figure 1: Rupture patches from earthquakes along the Aleutian megathrust, 1938-1996. Figure 2: A cartoon showing the Aleutian subduction zone megathrust fault (lower grey area) and what splay faults look like relative to it. Taken from https://www.unavco.org/science/snapshots/solid-earth/2016/vonhuene.html. Figure 3: Tsunami inundation map for King Cove. Report available at http://dggs.alaska.gov/pubs/id/29565.